His beak was bent and half torn. Was wrinkled, creased and worn. My first little paper bird. Was my Mother's encouraging love. Do the same thing on your blog. The first three folks who leave a comment and commit to doing this on their blog too, will get a surprise from YOU. I know people who've offered knitted or baked goods, and I like the idea that it ought to be something handmade. 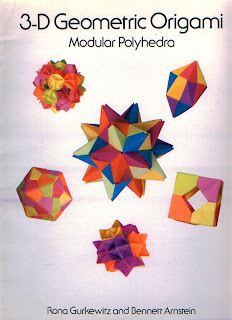 I am offering Origami. Tell me in your comments what you'd like, and I'll make it for you. Pretty much any animal or bird is safe, as are plants and boats. I like to do big modular pieces as well. If you find directions on the internet, I can generally do things that are easy to moderate -- there's some pretty complicated hard and expert stuff out there that I'm just not up to. If you want ideas, look at the pictures below. I'll also post a list on my other website so you know what I have directions for. 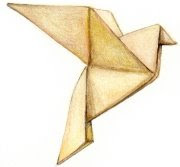 I was also struck by the similarity between poetry and origami — how a few spare words, carefully chosen, can bring a scene to life, and how a few small folds, artfully made, can bring a sheet of paper to life. I'll play. I'd like an origami version of a mecha or something from Nausicaa, please. That was Doug, by the way. It used the junc mail account. Miriam -- thanks for the kind words about my blog. 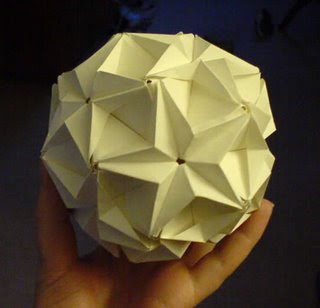 If you want some origami, You can have it without playing the game. He even has a video!